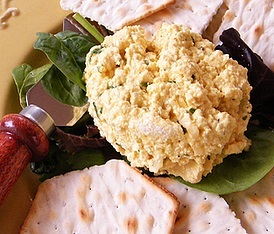 Eggless "Egg" Salad - Vegans Eat What? Vegans Eat What? I was attending a fundraiser for the Misha May Foundation in the fall of 2012 and this salad was one of the many items at the buffet. Now, I’ve eaten a lot of egg-free “egg” salad over the years, but this was so good I emailed Lorraine May, President and Founder of Misha May, to request the recipe. She directed me to Lynn Halpern, who graciously shared her recipe. Mash the tofu in a bowl then add all of the remaining ingredients. The secrets to this salad are using tofu that has been very well drained, not substituting regular salt for the black salt and finely dicing all of the veggies. Also, make the salad at least several hours before you plan on eating so the flavors have a chance to blend. This salad makes an amazing sandwich but is also good over a bed of greens or with veggies or crackers as an appetizer.